Here's a few pieces of artwork to make up for the last few "talking posts"... and another garden shot!! Star Spangled Blue cardstock that has been sanded with sandpaper, The red patterned paper and the darker patterned strip are both from the Everlasting Paper Pack, Bamboo Textured Cardstock that is also sanded. The white Daisy Cardstock has been scissor distressed. 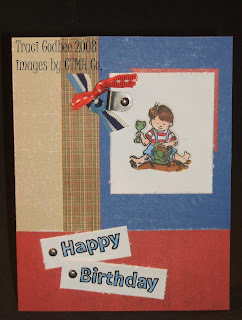 Ribbons are from the Holiday Ribbon Round Collection and Outdoor Denim Ribbon Round Collection. I also used Pewter photo hangers and brads. Little boy is from the "Play Time" Stamp set # D1294 and the "happy birthday" is from "Nursery Bash set #D1236"
This second picture is of a layout I made a while back of my nephew's birthday party- It's actually a 2-page layout but I'm just showing the left side. 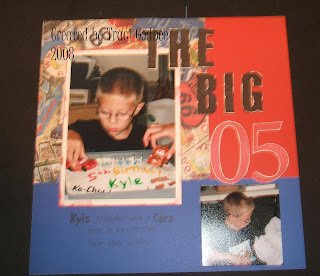 He had a Cars themed birthday and the Route 66 paper pack was PERFECT for this theme!! Sorry this photo is a bit blurry!! I didn't realize it till after I uploaded it. The alphabet stamps are the Rustic Alphabet and the numbers are from the Solo Numbers. The paper I used is awesome it's all about Route 66 and cars!! Well- I am having a big "garage sale" sort of event today and I need to finish setting up all of my old stamps and papers... I'll be back this weekend with more! !